Meet Alex McBride from Tangerines and Tulle. 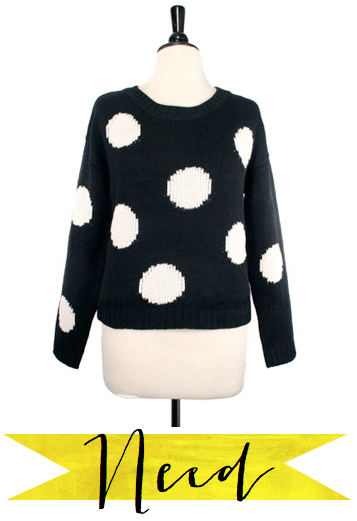 Need: I have been absolutely obsessed with oversized knit sweaters this fall, and this polka-dot one could not be more perfect! Its so cozy and will look adorable with tall boots! 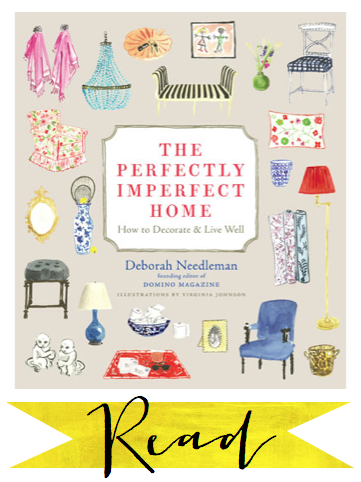 Read: I just recently picked up The Perfectly Imperfect Home: How to Decorate and Live Well by Deborah Needleman, founding editor of Domino Magazine and am in love. When I read it, I feel like I am learning from a woman who has impeccable taste, finds all her clothing at little no-name boutiques, has that curly-unruly-bedhead hair, wears a bunch of rings, and whose home is her most prideful possession. The illustrations are gorgeous, ideas genius, and indexes necessary for any interior designer or wannabe like me. Greed: I could not ask for better fall weather right now. It's right in between that time where the slight chill turns into the morning frost, and the more scarves, sweaters, and socks I can pile on, the better. But it's my biggest dream to have a tub like this to retreat to and warm my body and my soul. We don't have a bath tub at Lil' Puna, so I'm quite envious of Alex's greed. 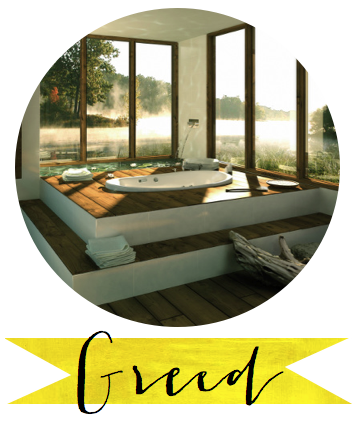 Here's to daydreaming about relaxing bubble baths! Ahh! P.S. Happy Halloween! I think I'll succumb to my sweet tooth and stuff myself silly with oodles of candy corn. How about you? Any bets on how many trick-or-treaters will venture up the hill? I've got a bowl of candy ready, but my guess is nada. I have been wanting that book! I just love coffee table books! oh heck yes, that sweater rocks. Love this feature. Too cute! That book has definitely been on my wish list. And that tub? I mean who wouldn't want that? thank you again Ashley!! I am just so giddy to have been featured!